See a movie with some historical photos, as seen on my pages. This movie shows some inventors, press fax, Fax Broadcasting and other facsimile services in the past. Smoke and drum signals are believed to have been the earliest form of getting messages from one place to another. We owe development of fax to a Scottish inventor, Alexander Bain, who was granted a patent for his creation back in 1843. And even now, after the invention of computers and electronics, Bain´s original concept is still the basis for modern facsimile machines. A copy of anything made, either so as to be deceptive or so to give every part and detail of the original; an exact copy likeness. Facsimile telegraph, a telegraphic apparatus reproducing messages in autograph. A fax machine scans an image, whether it be text or a photo, by reading a very small area of the image at a time. The fax machine decides whether the area it is reading is light or dark and assigns the area a number such as "0" for white and "1" for dark. Then the fax transmits the number to a remote facsimile receiver (usually via telephone lines). The receiver makes a mark on paper corresponding to the area on the original image. This process continues as the transmitting machine scans a series of small areas horizontally across the image, and transmits that information to the remote receiver. The transmitting fax then scans the next lower line and so on until the entire image has been scanned, digitized, and transmitted. Facsimile telegraph is one of the oldest telegraph techniques. 1843, 33 years before telephone and Morse (CW) was used, Alexander Bain introduced his"Bain´s Telegraph". Scottish physicist Alexander Bain develops and patents the first primitive facsimile machine. The “recording telegraph’s” sending device uses a stylus attached to a pendulum, which passes over metal type to sense light or dark spots on the metal plated “document” being sent. A pendulum on the receiving device makes a stain on chemically treated paper when an electric charge, which signifies a “dark” spot, is sent down a telegraph line. Frederick Bakewell developed a (facimile) system with tin-foil covered revolving drums for transmitting and receiving recorded pictures. Frederick Bakewell, an English physicist, was the first actually to demonstrate facsimile transmission. The demonstration took place in 1851 at the World's Fair in London. Bakewell's system differed somewhat from Bain's in that images were transmitted and received on cylinders, a method that was widely practiced through the 1960s. At the transmitter, the image to be scanned was written with varnish or some other nonconducting material on tinfoil, wrapped around the transmitter cylinder, and then scanned by a conductive stylus that, like Bain's stylus, was mounted to a pendulum. In 1865 Italian physics professor Giovanni Caselli established the first commercial fax system, which linked Paris and several other French cities, using a device called a Pantèlègraphe which was a modification of Alexander Bain's original idea. He transmited nearly 5,000 faxes in the first year. 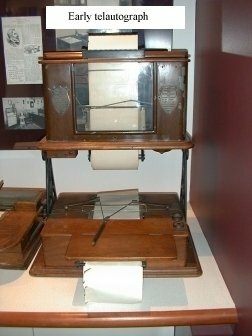 1888The Gray National Telautograph Company originated in 1888 when the company bought the patent for the first Telautograph (today known as facsimile) instrument from Omnifax founding father, ProfessorElisha Gray. According to the patent, the invention enabled “one to transmit his own handwriting to a distant point over a two-wire circuit". Gray had received much notoriety two years earlier for being just three hours late in filing his patent for the invention of the telephone. Grays's Telautograph was the first facsimile that wrote on stationary paper. This transmission to the Police in 1893 was the first public exhibition of the Telautograph. This “Standard” model also drew record crowds at the 1893 Chicago World's Fair. 1898 Hummel's Telediagraph . 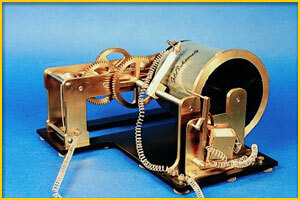 The Telediagraph was one of several early fax-like devices sending pictures via telegraph lines. It was invented circa 1895 by Ernest A. Hummel, a watchmaker of St. Paul, Minnesota. The first machines were installed in the office of the New York Herald in 1898. By 1899, Hummel had improved the machine and the newspaper had machines in the offices ofthe Chicago Times Herald, the St. Louis Republic, the Boston Herald, and the Philadelphia Inquirer. The system used synchronised rotating 8-inch drums, with a platinum stylus used as an electrode in the transmitter. The original image was drawn on 8x6" tin-foil using a non-conducting ink made from shellac mixed with alcohol. The image was received on carbon paper wrapped between two sheets of blank paper. When the electrode touched the tin-foil in the transmitter the circuit was closed; when it touched the shellac the circuit was open. The signal controlled a moving stylus in the receiver, making it touch or move back from the paper. At the end of each rotation a synchronising signal was sent, and the styluses in both machines moved 1/56" to the left before scanning the next line. The first picture sent was "an accurate picture of the first gun fired at Manila." The machine took 20-30 minutes to send the picture. The first practical photoelectric facsimile system is demonstrated by Dr. Arthur Korn.It employs the light-sensitive element selenium to convert the different tones of a scanned image into a varying electric current. This enables 'halftone' illustrations to be transmitted for the first time. Commercial use of Korn's system began in Germany five years later. By 1910, Paris, London and Berlin were all linked by facsimile transmission over the telephone network. Facsimile then made slow but steady progress through the ‘20s and ‘30s, and in 1934 the Associated Press introduced a wire photo service. Korn’s breakthrough of giving the fax machine “sight” prompted serious commercial experimentation by three American telecommunications giants: AT&T, RCA and Western Union. Korn’s success and achievement in using the fax brought new development and direction for broadcast publishing to the United States. Prof. Dr. Arthur Korn establishes also a commercial picture transmission system which uses radio waves to transmit pictures between Paris, London and Berlin. 1907 Prof. Dr. Arthur Korn developed the first commercial fax system to transmit pictures between Paris, London and Berlin. First facsimile test for “LÍllustration” Paris - Lyon - Paris. “Daily Mirror” London - Manchester - Paris. “ Berliner Lokal-Anzeiger” Munich - Berlin - Paris - Copenhagen - Stockholm. 1909 First facsimile test for “Colliers Weekly” New York - Washington. 1911The first amplitude modulator for fax machines is patented, permitting transmission via telephone lines. 1922 the first transatlantic facsimile services was provided by RCA.RCA faxes photos across the Atlantic in six minutes; AT&T, RCA and Western Union develop “high-speed” fax systems. Dr Arthur Korn's facsimile system is used to transmit, by radio, a photograph of Pope Pius XI from Rome to Maine, USA. The picture is published the same day in the New York World newspaper. - a major feat in an era when news pictures crossed the ocean by ship. 1926Rudolf Hell introduced the Hellschreiber. 1939First Daily Newspaper by Radio Facsimile. More than 1,000 U.S. households are experimentally equipped with fax receivers that electronically print morning newspapers overnight. 1941 Fax is enlisted by the military to transmit maps, orders and weather charts during World War II. 1948 The FCC authorizes commercial development of fax technology. Western Union manufactures 50,000 Deskfax machines, which are used to send telegrams between customer offices and Western Union offices. 1960The Electronic Industries Association (EIA) forms a fax standards committee which, in 1966, solves growing interoperability problems by issuing the first fax standard, RS-328. 1968Fax goes global when the Consultative Committee for International Telephone and Telegraph (CCITT) issues Group 1, the first international standard for fax. The first users of facsimile were newspapers to transmit and receive photos from around the world. The next user of facsimile were the weather services around the world. 1985 GammaLink produces the first computer fax board. 1987 Canon introduces the first plain-paper fax machine. 1995 JPEG-based standard for color fax is approved. 1996 First Internet faxing products are introduced; Pitney Bowes introduces the first 33.6 kbps fax machine. Fax machines from Muirhead and others still used the basic revolving drum technique, pictures are now sent in colour - originally by three separate transmissions, later by simultaneous transmission. Meteorology is the focus of many scientists all over the world, meteorology forecasts were not available on mass to the general public until H.C. Russell, New South Wales Government Astronomer and Meteorologist from 1870 to 1905, produced Australia's first newspaper weather map in 1877. Space meteorology on the other hand had its origins in the early 1950s. It was not until the 1st of April 1960, that the TIROS-I (Television Infrared Operational Satellite) the world's first meteorological satellite was launched. The first direct picture transmission took place on 21st December 1963 by TIROS-VIII. The World Weather Watch (WWW) and Global Atmospheric Research Program (GARP) were established worldwide.The WWW developed as an international collaborative system for global weather observation by satellite and by conventional means. The Global Research Program initiated a series of innovative developments in meteorological satellite technology during the 1960s and 1970s. The First GARP Global Experiment (FGGE) of 1979 provided the first global view of the earth's atmosphere, essential to the provision of medium-range forecasts, and essential to the understanding of the meteorological processes, which govern the evolution of climate. The spin-scan camera on board the Applications Technology Satellite ATS-1 provided near-continuous photo coverage of the earth and its cloud cover. This was the first weather satellite in a geostationary orbit, launched 6 December 1966. Three years later the first detailed quantitative measurements by satellite of the temperature and moisture of the atmosphere at various levels were obtained. While Queen Victoria never actually said, "I'll drop you a fax," she might well have done so if the history of telecommunications had taken a slightly different turn. The principle for facsimile transmission over wires was first patented as early as 1843, seven years after the invention of the electric telegraph, by Scottish psychologist Alexander Bain. B ain himself never performed a fax transmission, but it is clear from his patent application for "improvements in producing and regulating electric currents and improvements in timepieces and in electric printing and signal telegraphs," that his invention made facsimile transmission entirely feasible. Bain's invention used two electric pendulums, one at each end of the wire. Each of the pendulums was made to oscillate synchronously over a rotating roll. The sender wrote the text of his message using an electrically conductive material, then wrapped the message round the roll. As the pendulum swung over the paper, the transmitting needle picked up impulses where there was text, but no impulse where there was a gap in the text. At the other end of the line, the receiving needle made marks on photosensitive paper corresponding to the signals from the sending needle, thus reproducing the text being transmitted. Proof that Bain's principle was sound was eventually provided by Frederick Blakewell, an English physicist, who demonstrated a working facsimile machine at the World Exhibition of 1851, the largest exhibition of new technology ever held. His device was based on the same principle as Bain's design, also using rotating cylinders and styluses for recording and writing. So Queen Victoria could indeed have sent a fax, had she been so inclined, when she visited the exhibition in the huge Crystal Palace! However, it is a far cry from merely demonstrating a device at an exhibition to making it into a commercial success. The honor of designing the first fax service in actual use goes to Giovanni Caselli, an Italian abbot, born in Siena in 1815, who turned his hand to science and was, by 1849, editing a scientific magazine. In 1856 he claimed that he had developed a device, which he called a "pantelegraph," that could send facsimiles of images and text. Caselli received enthusiastic support from the French emperor, Napoleon III, who personally visited Caselli's workshop in 1860. He ensured that Caselli had access to the telegraph lines he needed, and a commercial fax service was inaugurated in Paris in 1865. It transmitted pictures and text between major French cities for some five years. A Pantelegraph Society was also founded in order to promote the new invention, which attracted extensive and enthusiastic press coverage at the time. When Caselli succeeded in opening a regularly working fax connection between Paris and Lyons, he was awarded the Cross of the Legion of Honor by Napoleon III. There still exist fully legible copies of letters sent by facsimile during this period, and a few contemporary facsimile machines are displayed in French museums. After Caselli's fax service achieved worldwide renown in the 1860s, he was invited by King Victor Emmanuel of Italy to demonstrate the fax machine at a world exhibition in Turin. He also made successful experimental fax transmissions between London and Manchester, and a company was founded to start regular services. However, it was swept away by the bank crisis of 1864. Even the Emperor of China heard about the pantelegraph and sent officials to Paris to study the technology. The Chinese realized the advantages of the fax principle for text written in Chinese, which, with its thousands of ideograms, created insuperable problems for the conventional telegraph. However, the negotiations between Peking and Caselli petered out without yielding fruit. Sadly enough, Caselli's invention was introduced at a time when the World had started to invest heavily in conventional telegraph services. The French telegraph authorities, for example, apparently disfavored Caselli's fax principle and instead promoted development of the already dominant Morse telegraph system. In the minds of the public, the pantelegraph was associated exclusively with the transmission of images. The advantages of also using it to send text were only dimly perceived in the 1860s. The Pantelegraph company in Paris did little to improve the situation, making only feeble efforts to promote its services. Convinced of the superiority of its technology, it was content to wait for investors to appear. None did, however, and the Pantelegraph company was eventually squeezed out of the market - an early example of how a new and superior technology failed to gain a foothold because an earlier technology was already established. Caselli's invention subsequently fell into disuse and he died a disappointed man in Florence in 1891. The fax made progress nevertheless. Dr Arthur Korn, a German scientist, invented the principle of photoelectric reading in 1902. By 1910 newspapers were regularly sending and receiving pictures between major cities in Europe. In 1922, Dr Korn managed to transmit images between Europe and the U.S. by radio. In the U.S. of the Roaring Twenties, the fax was expected to become a common household appliance and millions of dollars were spent on developing it. However, the anticipated breakthrough did not occur, and it was not until the 1960s that the fax machine spread from the offices of the leading newspapers to become a familiar item of equipment in other business sectors. Electronics companies, meanwhile, were preoccupied with other, seemingly more glamorous, inventions, such as television, and it was some time before fax machines became mutually compatible and reasonably priced. 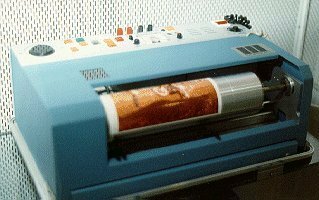 In 1970, there were no more than 50,000 facsimile machines in the entire USA. But by 1948, the AT&T fax system could be incorporated in a desktop fax and transmit a 15 x 20 cm photograph in seven minutes. The Japanese state telecom was the pioneer in opening its lines to public fax machines - not surprisingly, considering the advantages that the fax machine offers for transmitting text in a language with as many letters as Japanese, a nightmare to write on a teleprinter. The Japanese were drawing the practical conclusions of what the Chinese emperor had realized almost a century earlier. This was the start of the brief but intense heyday of the fax, which has radically changed our ways of communicating, only to be progressively replaced by direct communication between computers. It is intriguing to speculate about the enormous consequences for business and news services, not to mention homes, that an early breakthrough for Caselli's pantelegraph might have had. With telephone lines already spanning the world, the technology for the fax revolution was in place one hundred years ago. So it is not too far-fetched, after all, to imagine Queen Victoria faxing off her order for Scottish salmon!